On the first visit a thorough exam is performed and x-rays may be taken, if necessary. Findings will be discussed to begin a plan for care. Chiropractic care may include manipulation/adjusting of the spine and extremity bones if found misaligned. Your feet are the foundation of your body and misalignments will not support the body properly. Orthotics are foot arch supports and will be discussed if necessary. The patient is shown how to perform proper posture. The use of proper posture will allow the patient to control their body. The patient can bring correct posture to the home/work place, exercise workouts and everyday living. Medical research has shown how poor posture may lead to poor health. Correcting posture helps you stay well. Tight muscles will pull bones out of alignment, thus, muscle stretching should always be a part of your health routine. The patient is educated on the importance of muscle stretching and it may become a part of their treatment plan. A healthy, enjoyable exercise program should always be a part of our lives. Strong muscles protect our bones. Exercise causes the tendons of your muscles to put a healthy stress on your bones which causes your body to lay down more calcium. More calcium in bones means stronger bones. Thus, exercise will help you stay strong and help prevent injuries from occurring. Continued Chiropractic care can begin once your initial complaint has been resolved. What happens when you stop brushing your teeth and eating well? Your teeth begin to decay and you become tired and get sick. Spinal/extremity misalignments lead to degeneration and nervous system interruption. 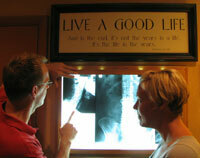 Add continued Chiropractic care to your health regime and maintain a healthy body. Chiropractic care is for all ages from children to mature adults. Call today and schedule an appointment at (480) 345-2080.